I think 2012 is going to be the year of the cupcake. I’m determined to make a to-die-for cupcake that looks as good as it tastes. Don’t get me wrong, these cupcakes were tasty, but I wasn’t successful in beautifully piping on the cream cheese frosting as I had envisioned. As for the pictures, I know that instagram isn’t typical Sweets Life style, but I found myself with a plate full of cupcakes and my DSRL several miles away. Desperate times call for desperate measures. Don’t let my subpar frosting application or photo quality deter you from these little gems. 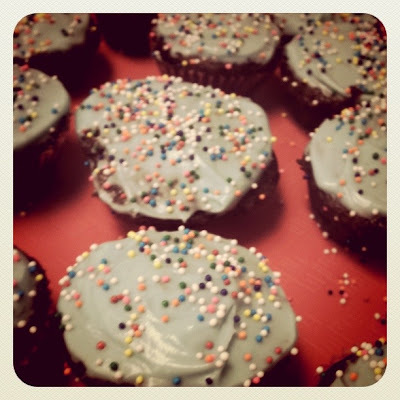 The cupcakes are light and chocolatey, a good match for the sugary sweet frosting. Because they’re bite-sized you can definitely enjoy two or three at a time! The perfect cupcake is still TBD…but get ready for some upcoming experimentation! Anyone want to tutor me on the art of frosting decoration?! Attention: I recently discovered (and I'm embarrassed to type this) that my contact page is working, but that I wasn't correctly going to the google document to see the results. If you have contacted me in the past several months and didn't hear from me, it's because I'm an idiot! I am slowly but surely working my way through everyone's stuff they sent me and I will personally reply to all of you no matter how long ago it was. My deepest apologies! 1. For the cupcakes...preheat oven to 350F. Line mini muffin pans with paper liners (or spray with cooking spray...I did some of each and the lined cupcakes were shaped the best!). 2. Whisk together flour, cocoa powder, coffee powder, sugar, baking powder, baking soda, and salt. Mix well and set aside. 3. In a separate bowl, mix milk, oil, vanilla, and apple cider vinegar. 4. With the mixer running, slowly mix wet ingredients into the dry ingredients, just until combined. 5. Divide the batter evenly among the prepared mini muffin pan. Bake for 10-12 minutes, until an inserted toothpick comes out clean. 6. Remove cupcakes and cool for 10 minutes before transferring to a wire rack to cool completely before frosting. 7. To make the frosting...beat the butter and cream cheese in a mixing bowl until fluffy (2-3 minutes). 8. Reduce mixer speed to low and gradually add sugar, mixing until smooth and scraping down the sides of the bowl as needed. Mix in vanilla. 9. Add food coloring, if desired, and mix to desired color. Frost and decorate cooled cupcakes as desired. *Note: I made the cupcakes 2 days ahead of time and refrigerated in an airtight container. 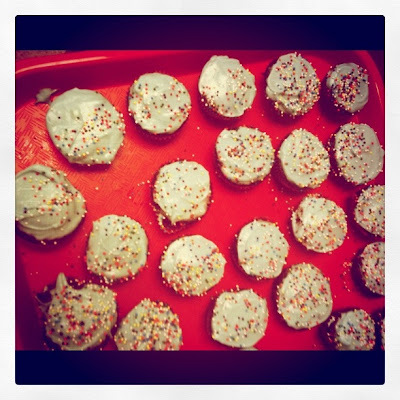 I then made the frosting the night before and assembled a few hours before serving.